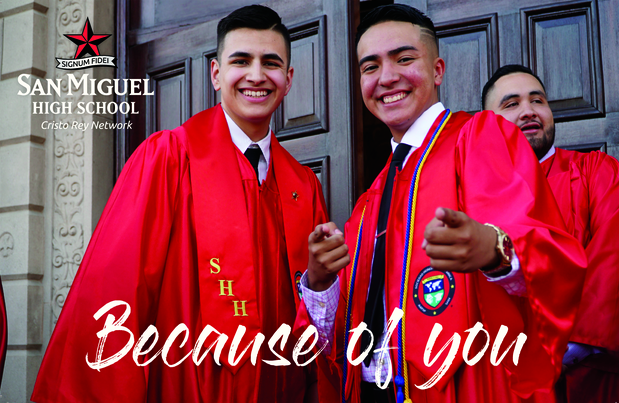 San Miguel High School, a Catholic, Lasallian learning community empowering youth from underserved families, nurtures a Christian spirit and integrates rigorous academics with practical experience, thereby transforming students to be prepared for college and career. San Miguel High School opened in 2004 in order to create a learning community where students from families of limited financial means have the opportunity to develop to their full potential. San Miguel is located in Tucson’s economically depressed south side where fifty percent of adult residents do not have a high school education and forty-two percent earn less than $25,000 per year. At San Miguel, students take a full college preparatory course load while simultaneously holding internships, working in corporations and earning nearly forty percent of their school tuition. The Corporate Work Study Program (CWSP) at San Miguel gives students the opportunity to form new identities as citizens and professionals who have bright futures.